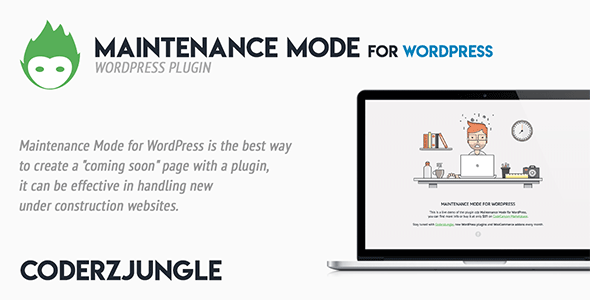 Maintenance Mode for WordPress Created by coderzjungle. This templates have specific characteristics, namely: Maintenance Mode for WordPress is the best way to create a “coming soon” page with a plugin, it can be effective in handling new under construction . You can use this Maintenance Mode for WordPress on WordPress category for addon, admin, coderzjungle, guest, maintenance, newsite, prelaunch, unavailable, user, wordpress and another uses. Maintenance Mode for WordPress is the best way to create a “coming soon” page with a plugin, it can be effective in handling new under construction websites. It’s always a good idea to put your site into maintenance mode while you are making some changes to your site so that the users doesn’t see a broken site. Add a maintenance page to your blog that lets visitors know your blog is down for maintenance, or add a coming soon page for a new website. User with admin rights gets full access to the website including the front end. Professional supportOur plugins will always be 100% compatible with latest WordPress and WooCommerce versions. Contact us for more info or problems, we are always ready for new bugs. Clean & optimized codeClean code is a reader-focused development style that produces software that’s easy to write, read and maintain. The best way to offer a better customer care. Pixel-perfect and responsive designWe consider every detail, down to individual pixels for a cleanest look of our digital products and we always try to have the maximum attention on it. Independent HTML templateOur plugin uses an independent HTML template to hide the WordPress development framework. You will be 100% hidden from the competitors. Show or hide a custom imageYou can set the logo of your company or a simple image on the maintenance page. Edit title and HTML textChoose the right title and text that lets visitors know your blog is down for maintenance. Add more info about your social pages with a free HTML editor. Customize colors & typographyYou can easily set colors and fonts in plugin settings panel, but if you need, you can use a custom CSS code to edit maintenance mode page design.